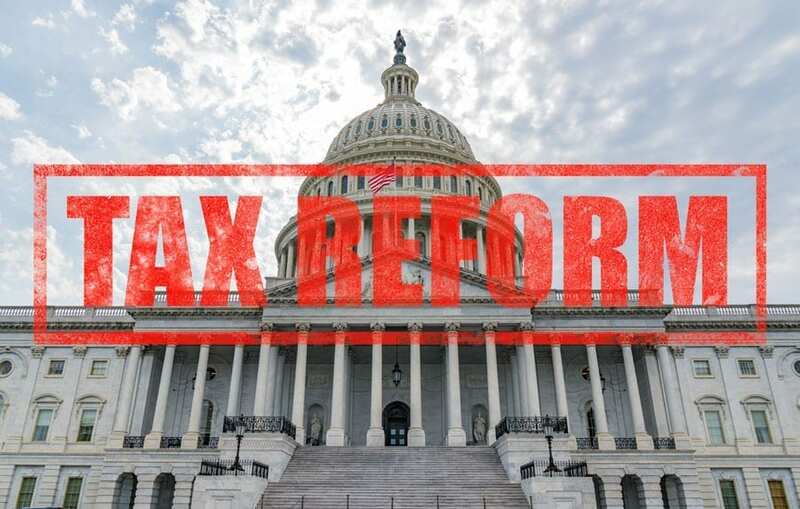 One of the biggest questions that many business owners face heading into the end of 2018 is how will the Tax Cuts and Jobs Act (TCJA) impact their 2018 tax returns. The bill was passed in late 2017 and many of the changes were effective January 1, 2018; however, many of the changes were clouded in uncertainty as to their operation and ultimate impact on taxpayers. While the law was written, new regulations that help to interpret and enforce the law were needed. Throughout the year the IRS has provided much of the necessary regulations and guidance, helping to best navigate these new laws. As we reach the close of 2018, below are the 10 biggest changes that business owners need to be aware of regarding 2018 tax reform. Bonus depreciation and Section 179 expensing are 2 sides of a similar coin. Both allow for something very favorable for businesses; the immediate deduction of capital expenditures, rather than ratable depreciation deductions over several years. In practice, the two systems work very similarly, by allowing the immediate deduction of capital assets. However, there are several key differences. Generally speaking, Section 179 expensing will be more favorable to businesses, as many states do not allow for a deduction of bonus depreciation but will allow for Section 179 expensing. There also are certain capital expenditures that may not qualify for 100% bonus depreciation but qualify for Section 179 expensing. Finally, Section 179 expensing has an upper cap on the amount that may be claimed per year, whereas bonus depreciation is unlimited. The Takeaway: With the change to allow for 100% bonus depreciation and expanded Section 179 expensing, businesses should not fear the purchase of additional equipment or improvements as they will provide an immediate tax benefit in 2018. The Takeaway: Current C Corporations should evaluate their 2018 estimated payments and cash flow budgets for the reduced tax burden; pass-through entities may wish to evaluate the merits of changing their corporate form from a tax perspective. When a business’ expenses exceed its revenue for the year, it generates a Net Operating Loss (not to mention a big headache for the business owner)! 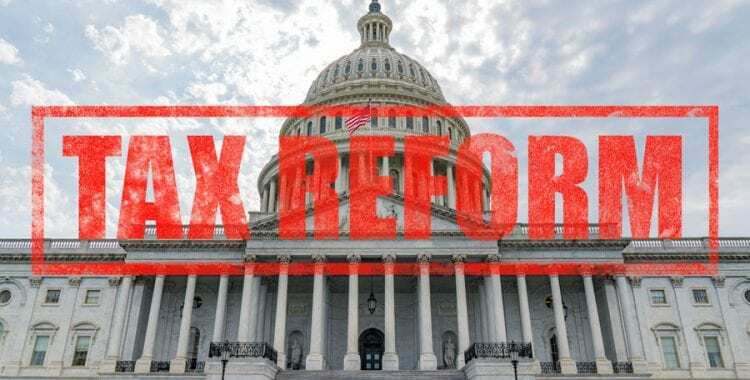 Prior to tax reform, these operating losses could either be carried back for 2 years to get a refund on any taxes paid in those years or carried forward for 20 years to offset future income. For losses generated in tax years starting after December 31, 2017 (so years 2018 and later), these losses are no longer allowed to be carried back and can only be used to offset a maximum of 80% of taxable income in any given tax year. These losses can now be carried forward indefinitely. Any losses from 2017 and prior are not subject to the limit. Also note that individual taxpayers can have a Net Operating Loss as well (such as a pass-through business owner with large losses) and the same rules and limitations above apply. The Takeaway: This change is largely prospective, but something to keep in mind for cyclical businesses that may generate losses in one year and profit the next. This will require additional tax planning and potentially estimated payments, where none were necessary in the past. For most taxpayers, the Cash Basis of accounting is the preferred and simplest method, particularly for income tax purposes. The Cash Basis allows for income to more closely reflect the cash flows of the business and generally is easier to implement. Before tax reform, C Corporations (or partnerships with C Corporations as partners) or any business with inventories were required to use the accrual basis of accounting if their gross receipts were above a certain level. Additionally, businesses with inventory were required to add to the cost of the inventory certain expenses (rather than deducting them outright). Starting in 2018, the gross receipts level for these rules has been raised to an average value of $25 million or more, up from prior levels of $5 or $10 million. The Takeaway: Business owners who were previously required to use certain accounting methods may now be eligible for a “simpler” method and such change may have an immediate tax impact. Business owners should evaluate which method of accounting for tax is the most appropriate for them. Capital is typically the most important fuel for business growth and one of the most common ways to acquire this capital is via loans. Prior to 2017, any interest charged for these loans were deductible by businesses in full. Starting in 2018, the amount of interest deduction is limited to 30% of “adjusted taxable income,” which can best be thought of as EBITDA (earnings before interest, taxes, depreciation and amortization). However, it is important to note that this limitation does not apply to businesses with average gross receipts of less than $25 million. Additionally, there is an election to opt out of this limitation as well, with a significant trade off in depreciation deductions. The Takeaway: Business owners should review their current capital structures and interest costs in comparison to their EBITDA to ensure they will not lose any interest deductions. Meals and Entertainment deductions have long been an area of controversy for taxpayers and sometimes the bane of existence of tax preparers, but also an important tool for many owners in order to generate new business. Entertainment expenses, such as sporting event tickets, concerts, or golf are no longer allowed as a deduction for tax years starting in 2018 and beyond, unlike in prior years were these expenses would be allowed as a deduction so long as they were not lavish or extravagant and had a substantial business purpose. Meals with current or prospective clients and similar business contacts are still allowable as a deduction at a 50% rate, same as in years prior. As always, business owners should have complete documentation for these expenses, including receipt and a brief memo of business discussions. The Takeaway: Owners should review their 2018 to date Meals and Entertainment expenditures for deductibility considering this new law change and should update their budgets and policies to reflect this change. The Research and Development Credit is one of the better credits available for taxpayers and can apply to a wide variety of businesses. These credits are a direct dollar-for-dollar reduction of tax liability, rather than a deduction which only decreases your tax base. The TCJA made this credit permanent. Under prior laws this credit was part of the “tax extenders” package, meaning it was subject to annual renewal by congress. The Takeaway: Businesses which have benefited in the past from the R&D Credit may continue to do so, so long as they have qualified R&D activities. As noted above, the tax rate for C Corporations was reduced to 21%; however, since most businesses in the US are not organized as C Corporations this change provided little benefit to many owners. In recognition of this fact, the TCJA enacted the Qualified Business Income (QBI) Deduction, providing tax relief to pass through entities such as S Corporations and LLCs. In theory, the QBI deduction (also known as the 20% deduction) is rather simple: an additional 20% deduction against business income of a pass-through entity. So, if a pass-through business has $100,000 of taxable income, the QBI would provide for an additional $20,000 ($100,000 x 20%) deduction, making the taxable income to the owner only $80,000. In execution, the deduction is far more complex, specifically in regard to what businesses may not qualify for this deduction. 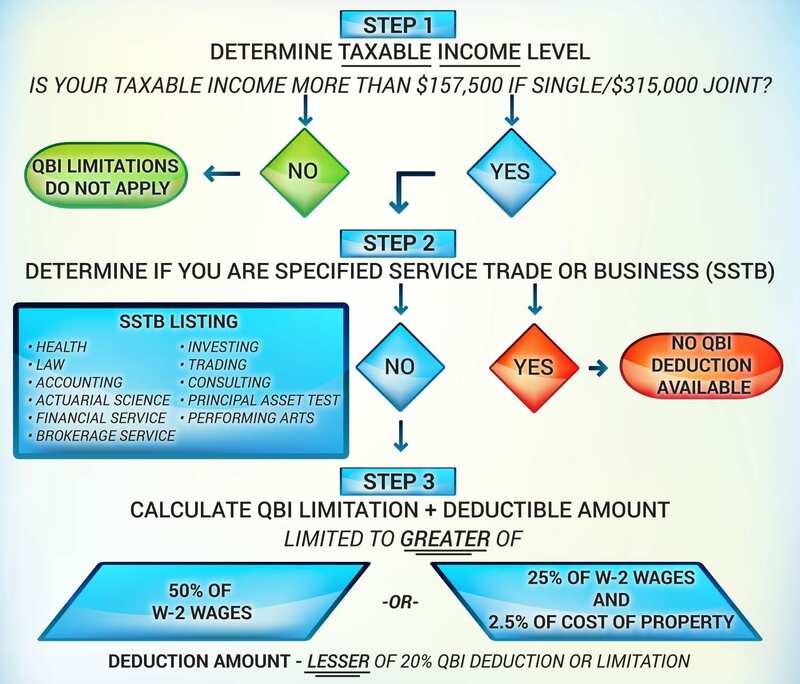 The steps to determine this deduction can best be summarized by the below flowchart. The Takeaway: For many business owners, this change was the granddaddy of them all. The effect of the 20% deduction would be to reduce the top rate from 37% to 29.6% effective on this income, providing much needed relief for business owners. The calculation and limitations can be quite complex, and owners should work with their accountants to determine if they will qualify for this benefit and the potential savings. Luckily, the IRS has taken very taxpayer friendly positions with the implementation of these rules. While the focus on this article is largely on business changes, the elimination of certain individual income tax deductions will have a big impact on owners of businesses. The 2 most impactful of these changes will be the limitation of State and Local Taxes (SALT), such as real estate taxes and state income taxes, to $10,000 per year and the removal of Miscellaneous Itemized Deductions (items like union dues, investment fees, job hunting costs). Combined with am increase in the standard deduction to $12,000 for single filers/$24,000 for joint filers, it is possible many taxpayers who used to itemize their deductions will no longer do so. The Takeaway: The limitation on these deductions hurts many taxpayers, particularly those in high-tax states. In years prior, it was usually advisable to prepay any state income tax due in order to best time that deduction, however, with the limitation this planning strategy is no longer necessary. Although, as noted above, many individual taxpayers may be losing certain deductions, the impact of this may be largely mitigated by an across the board deduction on ordinary income rates for 2018. The income level for the top bracket is higher than in past year, and the top rate now decreases to 37% vs 39.6%. The Takeaway: One of the primary goals of tax reform was to decrease tax rates across the board for individuals, and these new rates have certainly done that. So even though many taxpayers may see an increase in taxable income due to the elimination and limitation of certain deductions, they should have an overall decrease in tax because of these newer rates. Ultimately, the 2018 Tax Reform could be viewed as a big positive for business owners. While there may be some eliminations of prior popular deductions, business owners should greatly benefit from expanded bonus depreciation, lower tax rates, and the new 20% business income deduction. Business owners need to be aware of these important changes as they can have a major impact on future cash flow. Proper planning is necessary to make sure business owners are taking advantage of all these new opportunities.